Noelle LoConte, MD, associate professor, Hematology, Medical Oncology and Palliative Care, responds swiftly when asked why funding for pancreatic cancer research has lagged in comparison to other types of cancer. "Patients are not living long enough to be their own advocates," she said. Survival rates have not improved for decades, and pancreatic cancer remains the third most deadly form of cancer in Wisconsin, with more than 55,000 new nationwide diagnoses annually. A new clinical trial conducted overseas that was presented at the American Society of Clinical Oncology meeting in June 2018 brought the first good news oncologists had heard in years: average survival of study participants was four and a half years, the longest survival ever demonstrated in pancreatic cancer. "I burst into tears during the presentation," she said. To raise awareness of an annual Roll and Stroll for Cancer event that occurred on August 12, 2018, a news story highlighted Dr. LoConte's perspective as well as that of former Wisconsin governor and former US Secretary of Health and Human Services director Tommy Thompson, who has lost two siblings and a childhood best friend to the disease. 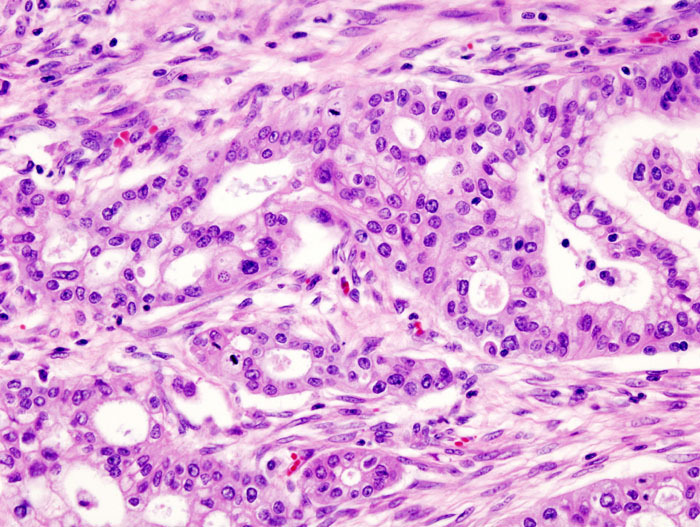 Photo (top): Histopathogic image of pancreatic adenocarcinoma (a common type of pancreatic cancer) arising in the pancreas head region. CC BB-SA 3.0, courtesy of KGH.